The distinctive fruit has been picked by the bucket-load, to obtain the purest fruit essence, pure enough to match the sanctity of ingredients in 42 Below vodka. 42 Below do not just add feijoa juice or synthesize the flavour. They collect the flesh of the fruit. They gather the heady, fruity steam produced when it is heated. They turn that into a liquid which is the very essence of the feijoa, and they infuse that into the vodka. The result is a crystal-pure vodka infused with the intense flavours and aromas of this slightly citrus, slightly sweet, very fresh and almost strange fruit. A fruit well known by New Zealanders and South Americans, but little known elsewhere. A real backyard fruit - and that is where you find the ingredients to go with it such as fresh mint, local apple and pear juices or citruses. It is a world first from 42 Below and there are more unique flavours up their sleeves yet! My cousin came from New Zealand to visit. She got me a bottle of this as a gift. Ot is awesome. Not too strong spotless flavour. Great straight or as a mixer. I will be purchasing more in the future. I got a bottle of this after it appeared in the feature section when I was buying some Thunder Toffee vodka (which is amazing!). This stuff is awful! It smells of Deep Heat and tastes as I imagine that would taste. Nobody could drink it! 42 Below Feijoa Vodka mixed with apple juice, nothing beats it. Wow! Mix with equal volume of good quality gin in a tall glass and top up with champagne and appletise or cider. A bit of lime zest would probably look nice on the rim and if cut over the drink would add to the flavour (lime goes very well feijoa). I can't wait to get home to my feijoa tree one day. This vodka is simply delicious and if you are an ex-pat Kiwi residing in Britain I am sure you will love it! Try it over ice with organic pressed apple juice for a refreshing summer drink. It's a taste of NZ and best appreciated if you have tried the Feijoa Fruit...I wonder if it's available in the UK or if I'll just have to add this vodka to my daily fruit intake? 42 Below Feijoa is delicious! I love it, it is also one of my favourite drinks by far. A lot of people say it has a very clinical taste, I disagree. 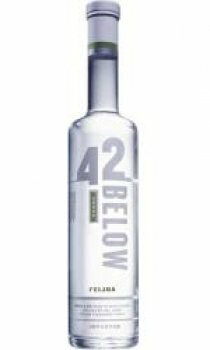 I think it has a unique taste all of its own and 42 Below has mastered the arts of producing a vodka with the integrity of challenging other vodka's to the personal favourite position. To all others, good luck. For me, this stunning livation will remain by far the favourite! I mix it with a dash of lemonade for a truely satisfying drink. Not only the scintillating savouring of super smooth voddie but the zinging delights of New Zealand summer feijoa-feasting memories arriving to the palate in one massive bang... left me with a huge smile! What a fantastic taste. Try this Vodka with Appletizer and a slice of lime. I promise that you will enjoy it. They have got the unique taste of a feijoa spot on. This is a must drink for summer. I think scott is not used to the flavour of a feijoa. For those of you that love feijoas, you will love this vodka. Its pure pleasure. 42 Below have managed to infuse the vodka so much with feijoa, that you think your drinking vodka made solely from feijoas! My favourite vodka by far!